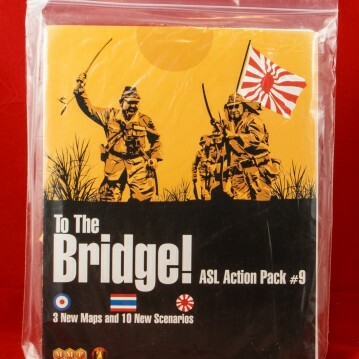 Home > Products > Action Pack #9: To the Bridge! 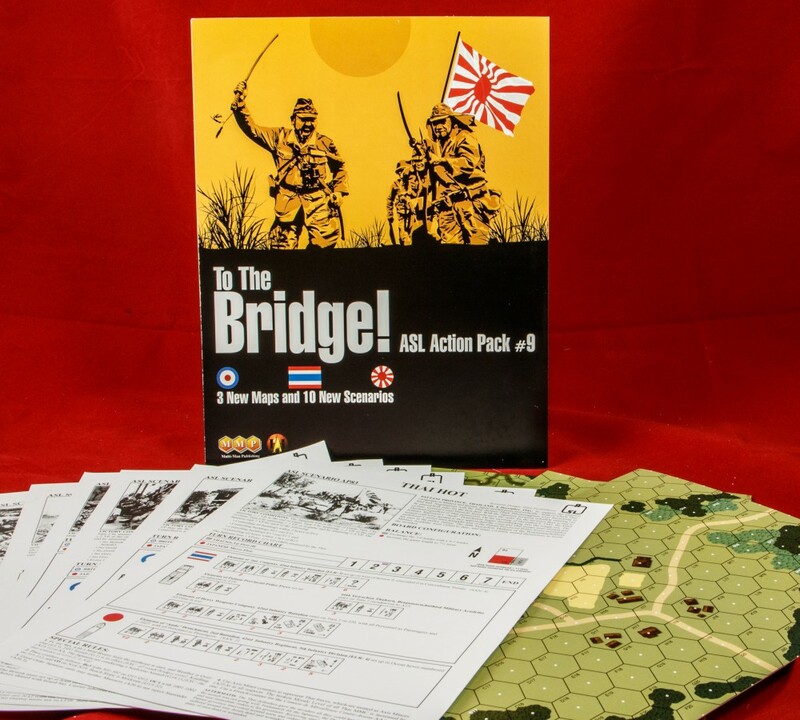 12.2014 Action Pack #9: To the Bridge! Action Pack #9: To the Bridge! (AP9) is both the latest Action Pack from MMP as well as the latest Action Pack designed by Gary Fortenberry and featuring his 11″ x 16″ two-sided geoboards. 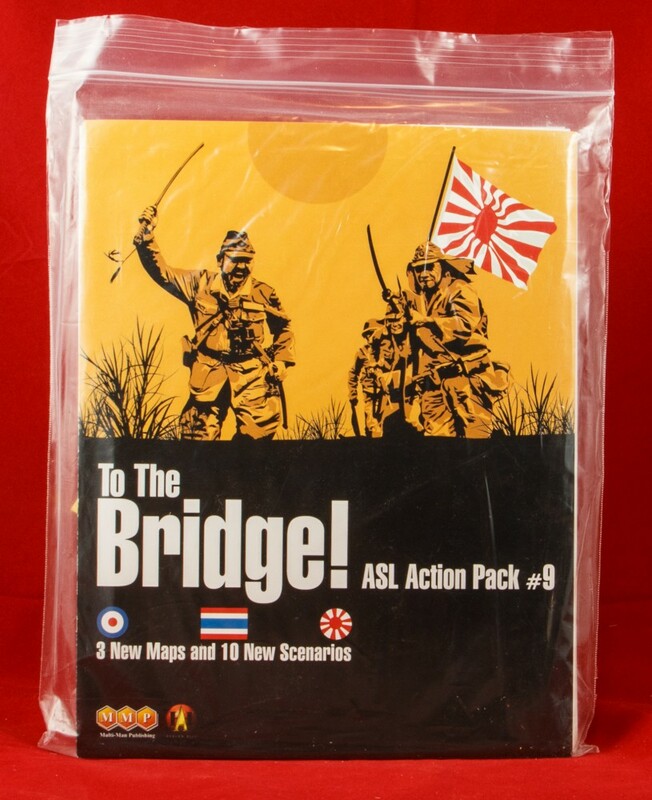 AP9 is themed with a very narrow theme: all of the scenarios included therein take place in (or, in one case, is related to) the Japanese invasion of Burma in December 1941. To be more specific, they take place during the early period of said Japanese invasion, because the Burma campaign lasted from December 1941 through May 1942, but AP9 includes no scenarios set after February 1942. This was the period in which the campaign was in many ways decided, as much of the Burma Division dissolved (its Burmese soldiers not being interested in fighting) and much of the 17th Indian Division was lost after the premature blowing of the Sittang Bridge (the bridge in the title of AP9) left it stranded on the wrong side of the river. The disaster at Sittang essentially insured that the Japanese would capture Rangoon, which itself insured that the Allies could not hold Burma; the remainder of the Burma campaign was essentially a controlled retreat by the British and Chinese forces back north and, eventually, out of Burma. Action Packs typically consist of only two types of components, geoboards and scenarios, and AP9 is no exception. It brings three new 11″ x 16″ geoboards to the mix, each of them designed to be compatible with Burma scenarios. As Burma is a land of exceptionally varied terrain, from vast flat fields to high, rugged mountains to dense impenetrable jungle, a board designer has a lot of flexibility. Each board is double-sided, though the reverse (b) side is virtually identical to the front side, with only a few board-edge woods hexes shifted by one hex. The double-printing thus adds to the price without providing any real benefit. Board 7a/7b is a mostly-wilderness board, with a few “homesteads” thrown in. 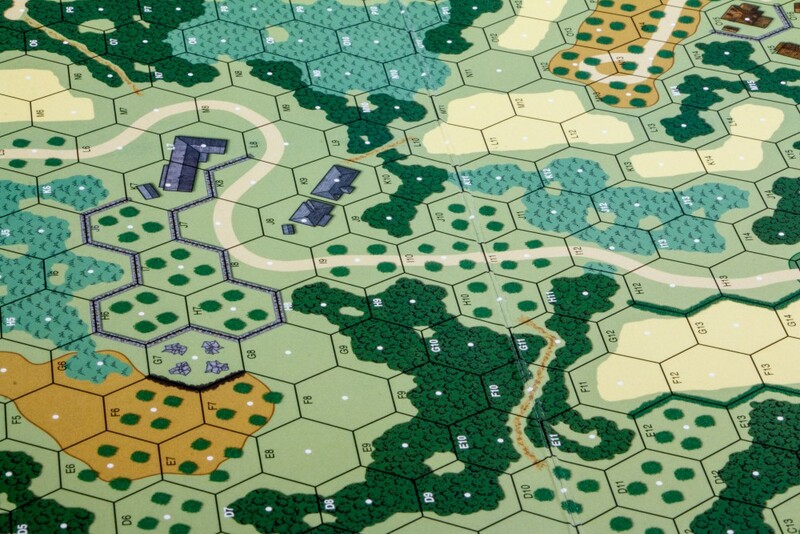 Its incredibly dense terrain configuration (there are few places where one can even see three open ground hexes in a row) is mostly woods, brush and orchards (or its PTO equivalents, of course), interspersed with small hills and valleys. Civilization is provided by three building/wall clusters. Two of them can be relatively easily eliminated with overlays, allowing a “wilder” use for the board, but the third cluster includes an annoying 8-hex-long wall that could only be eliminated via multiple overlays or via SSR. Still, even though these changes are required, Board 7a/7b still makes a fairly decent PTO board. 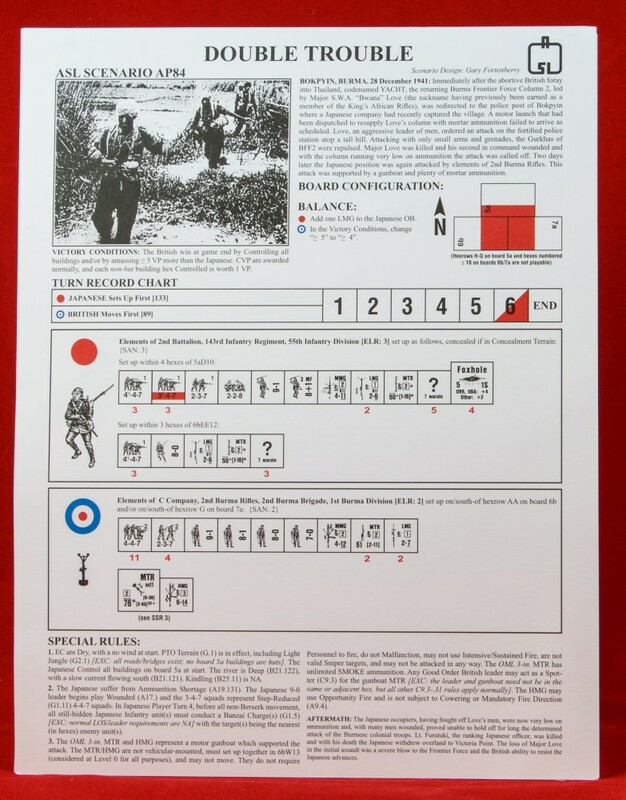 Board 8a/8b is an urban/hill board designed to represent a Burmese mountain or hill country village (many of the high-elevation regions of Burma were occupied by various ethnic minorities, some of whom, such as the Kachins, became great guerrilla fighters for the Allies). It is dominated by two hills in its upper left corner, one of which is topped by what is probably intended to be a Buddhist temple. This board, too, is very dense in its terrain depictions, filled with small wooden buildings/huts. Overall, it is a pretty good representation of a hill country village for Burma (also suitable for Malaya, the Philippines, Indonesia, and China, not to mention some Mediterranean/Balkan locations as well). It is a fine addition to the ASL map oeuvre. The third board, 9a/9b, is starkly different. 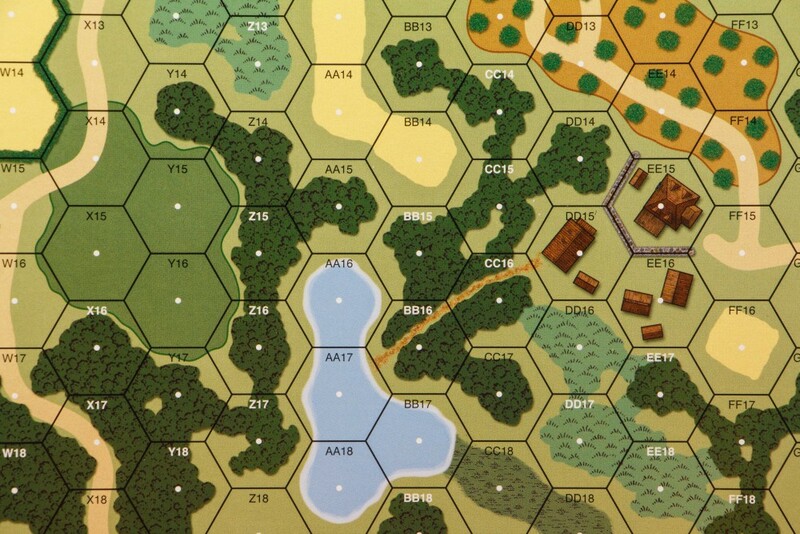 It is a wide open board consisting mostly of open ground hexes, with a few wooden buildings and a few small grainfields. This is presumably intended to represent some of the flat, agricultural land that bordered much of Burma’s several great rivers. 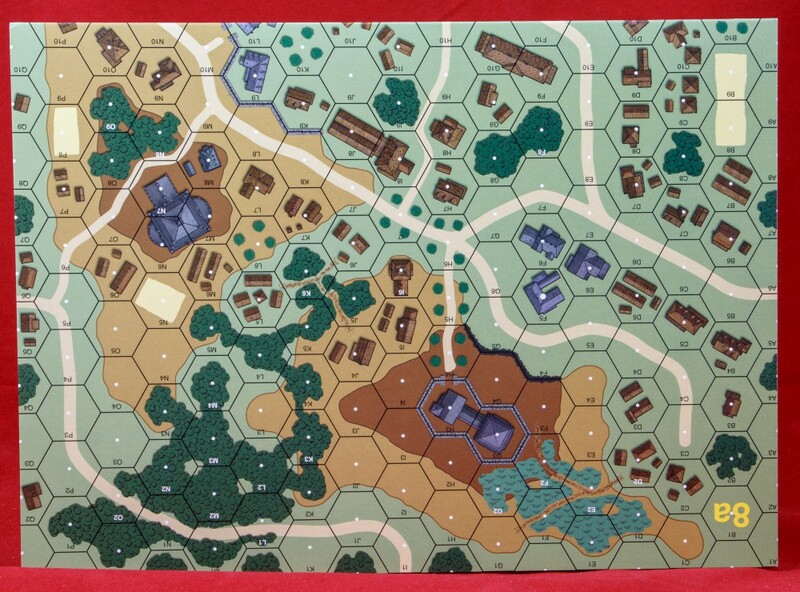 To be realistic, the board will need multiple rice paddy overlays, or even an SSR that says that all non-road open ground hexes are rice paddy hexes (as, yes, rice cultivation was truly that extensive in these areas). 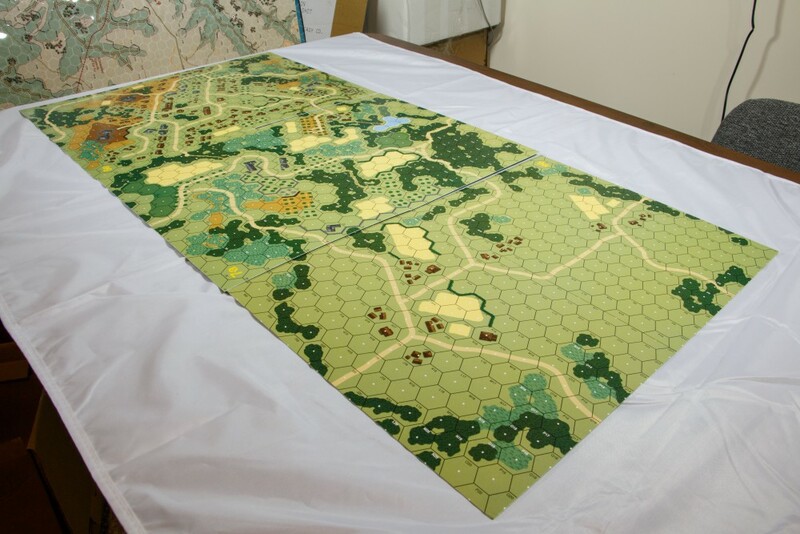 Obviously, this board can also be used for open areas in France, the Soviet Union, eastern Germany and Poland, the Hungarian plain, and elsewhere. Overall, the boards are pretty solid in their design. The graphics are up to modern MMP standards, which means they look quite nice. AP9 comes with 10 scenarios with which to test out the boards. Every scenario uses at least one of the included boards. Board 7a/7b sees use 6 times, Board 8a/8b is used 4 times, and Board 9a/9b is featured 2 times. In addition, the following boards are also used: 3a, 5a/5b (twice), 6a/6b 9twice), 40, 62, and 22. The scenarios are generally rather small in board area, with 7 of the 10 scenarios using one board-equivalent or less. The scenarios are also typically small in size as well, with 6 scenarios being small, another 2 dipping into the medium range, and only 2 scenarios that one can consider large. Most of the scenarios in AP9 are suitable for tournament play. This fact has resulted in them getting quite a bit of play in the early months after publication; so far, the results are gratifying, with none of the scenarios showing any tendencies towards doggishness. One scenario has OBA; another scenario uses the Night Rules (and also Rice Paddies). 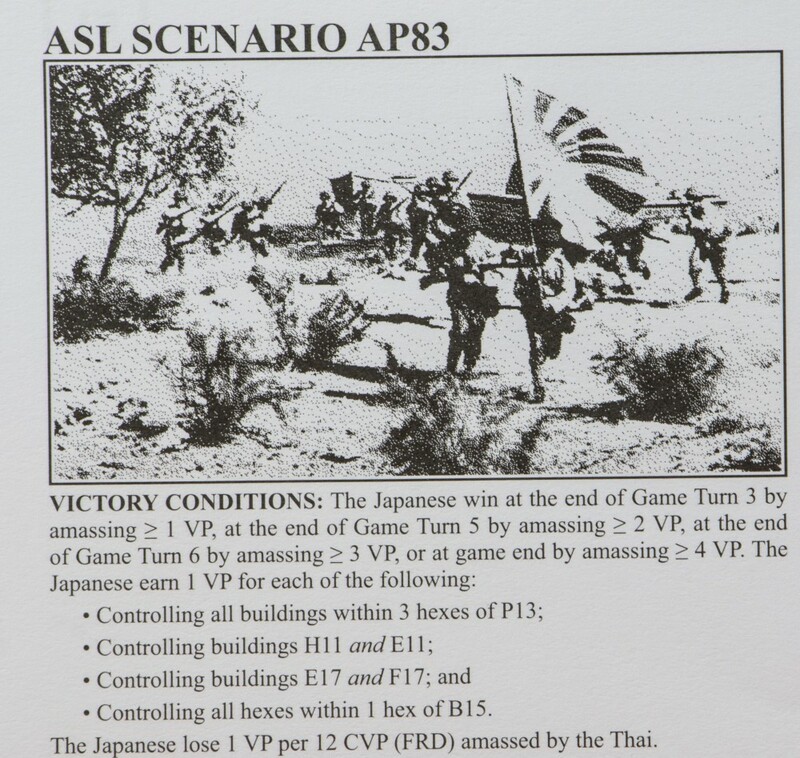 One scenario, AP83 (Thai Hot), which features a Japanese vs. Thai action, is a Japanese Seaborne Assault. Because it is so small, and because Japanese Daihatsu are so less complicated than American landing craft, this can be a good introductory scenario for Seaborne Assaults. The two larger scenarios, representing parts of the key battles for Moulmein and the Sittang Bridge, offer ASLers the chance for some particularly meaty PTO action. AP92 (The End of the Beginning), set at Sittang, is an 8.5 turn scenario that pits 26 Japanese squads and 5 crews, quite well led, against 29 British squads and 4 light AFVs, also pretty well led. 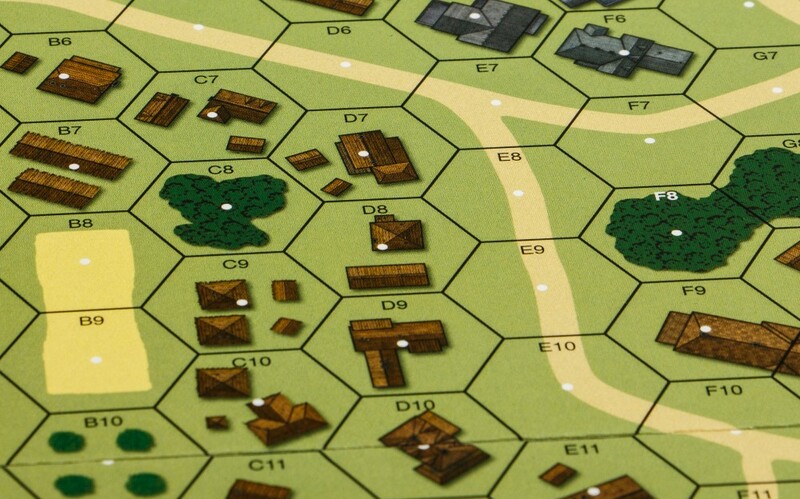 The Japanese have to clear hills and/or exit across one of the larger map areas of AP9. 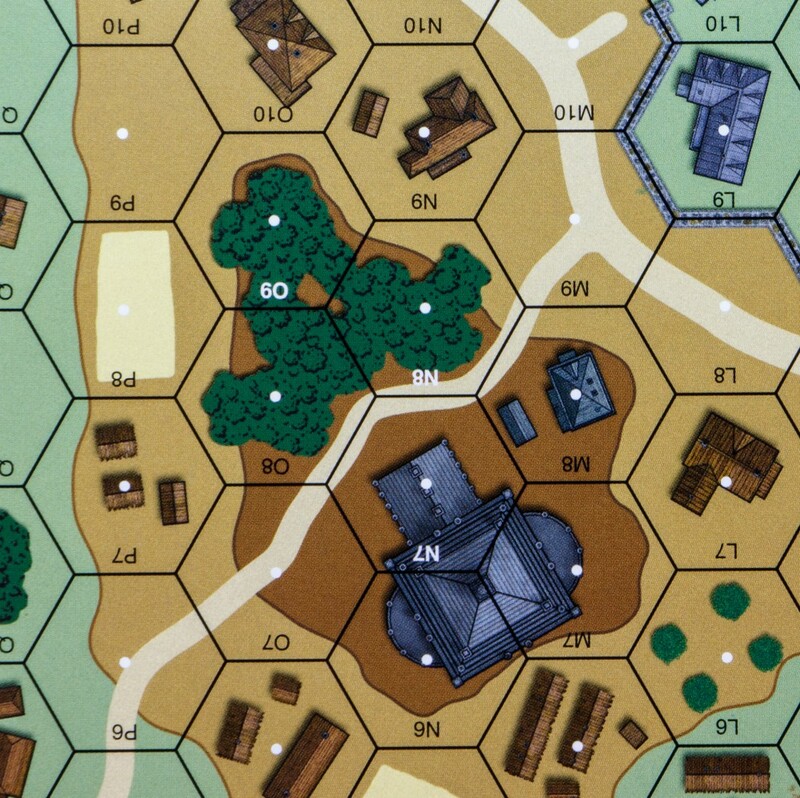 AP87 (Empire’s Fall), a 9.5 turn scenario (though it can end earlier), features another large Japanese attack. In this action, the Japanese have 29 squads and 6 crews (but fewer and poorer leaders than in the other scenario, plus some OBA. The defending British have 35 squads of mostly poor quality, and 4 40mm AA guns, plus some OBA of their own. One thing that a number of the scenarios share, and which these scenarios share with other Gary Fortenberry-designed scenarios, are complicated victory conditions, some of which require much parsing in order to figure out. However, it should be acknowledged that the percentage of such scenarios is less than in Fortenberry’s previous Action Pack, so in some respects AP9 represents and improvement. Generally speaking, AP9 will appeal to all PTO fans, to Burma fans, and to fans of fast-playing tournament-sized scenarios. The two meaty scenarios even give Hardy Man ASlers a couple of bones to chew.